Who are the top ten tight ends in dynasty fantasy football right now? It’s been a true pleasure running through this top ten positional rankings series. Getting to glamour and rave about the amazing young talent we have in our game has me more excited than ever to get the season underway. In today’s edition, which is, unfortunately, the final one, we have ourselves an especially interesting group of tight ends. With four players age 23 or younger, and five who are at least 28, there’s a deep pool of talent available for rebuilding and contending owners alike. Let’s dig into our top ten dynasty fantasy football tight ends! As much as it hurts to say, idk about keeping Greg Olsen on the list. I would put Trey Burton or Jordan Reed’s injured self on there. Is Olsen a better TE? No doubt. Will Olsen scores more points? Probably. But after this year who knows how much gas is left in the tank for Olsen. Great analysis though! Thanks for the comment, TL! Burton and Reed we’re definitely considered, as were Delanie Walker and Mike Gesicki. But after lots of thought, Olsen seemed like the choice for me. Projecting out to the January update of these rankings, I won’t be surprised at all if Olsen doesn’t make the cut. Retirement rumors could very well be in full swing after his 2018 season comes to an end. It’ll all be very interesting to see. I hope that made sense. Thanks for the comment, TL! I think keeping Olsen in there is a must and Jordan Reed is a possibility, but Cameron Brate is disrespected everywhere…the guy is a stud and if Howard took over the spot the Bucs would cut brate and he’d ball out somewhere else. Hey Giovanni! I appreciate the comments. I understand why you feel Brate should have been included. I, like you, agree that he can tend to fly a bit under the radar. But when assessing his long-term value, I just couldn’t place him in the top ten. I guess we’ll just have to see what happens with his career. Great point on Walker. I really, really like him, but at age 33 (and turning 34 very soon), it might be a bit hard for him to be on this list. Thanks for the comments, Giovanni! I agree with this list, maybe I might have Graham a little higher but this is pretty spot on, imo. I also like Olsen, as he’s been one of my favorite TEs over the years, I will be pretty happy if I can get two more seasons out of him in my leagues. Hey Billie, thanks for the comments! I love your view on Olsen. I’m glad you enjoyed the article! David, Howard, and Hunter over Rudolf!?!?!?!?! Based on what exactly? Hey Gregory, thanks for the comment! All three of those guys were put over Rudolph because of upside/potential. We know Rudolph is a solid mid TE1, and has a good amount of years left, but his ceiling just isn’t very high. With Njoku, Howard, and Henry, they all have very real shots of one day becoming perennial top five producers at the TE position. I hope this helps explain my ranks. Thanks for the comment, Gregory! Bradley thanks for the detailed list. I’m trying to go for it this year and am eyeing Olsen in a ppr league. What’s fair value for him with his age and all. Mid 2nd rounder? A wr like Emmanuel Sanders? Maybe a 2nd and a 3rd? On a side note, what do you think about Kittle out in SF? I think you have his value pretty down pat. A mid second rounder is about as fair a value as you’re going to get. Emmanuel Sanders for Olsen straight up wouldn’t be a bad deal necessarily, but I don’t think you would be coming out on top. As for Kittle, I really like him! He’s 24 years old, and has already earned a starting job in what should be a solid offense. I don’t think he’s someone I want to be starting right now, but long-term, he’s a nice piece to have. Thanks for the comment, George! I hope this helps. Any under the radar TEs you’re a fan of? I just acquired Kittle for a 2nd and 3rd as I couldn’t get a stopgap TE like Delanie Walker or Greg Olsen with my Hunter Henry out, and didn’t want to pay up to get someone the level above Rudolph. Others out there you like either as a 1-2 year rental or slower to develop good stashes at current price point? I actually love Kittle. But it sounds like you need a starter right now, and as much as I like him, he probably isn’t that. Jack Doyle would be someone I would look into. He should finish right around TE 10 or 11 this year, and if whoever owns him doesn’t think too highly of him, I would go after him. There aren’t many others I’m high on, but if you can Doyle and have Kittle as the backup, you should be more than fine there. I hope this helps, Shane, thanks for reaching out! Davis Njoku is rated way too high! He shouldn’t even be in the top 10. Delanie Walker, Cameron Brate, and Jordan Reed absolutely belong on the list if Greg Olson and Jimmy Graham are. Walker has been a beast the past three seasons, Brate is a touchdown machine, and Jordan Reed is a top 5 TE when healthy. Yes, health does matter, but listing Olsen on the list and omitting the injury concern is a slight to the talent that Reed has. Big difference between those two TE’s is that Reed has many years left to play. Can’t say the same for Olsen. And Walker is old, but he’s been very reliable to date on the injury front. I’m curious as to what goes into the decision-making process of a top 10 dynasty TE? There MUST be some tangible criteria that is used, but it seems as though everything is just subjective. All I hear are terms like “upside” or “athlete” or “potential”. How are terms like measurables, production, and age not giving players more street cred? 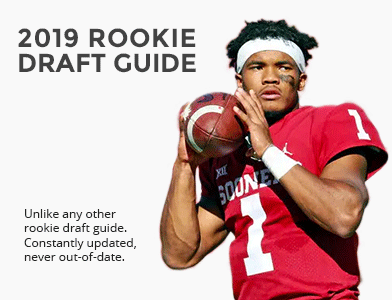 Let’s compare two 2017 rookie TE’s – Njoku and Kittle on tangible criteria. We can use snaps, targets, catches, yards, Avg/catch, TD’s, 40 time, bench, vertical, broad jump and 3 cone. As an athlete and in production, Kittle was better. Then add in their situation and QB and again, I think Kittle comes out on top. Kittle has Jimmy G and Njoku has Taylor/ Mayfield. But somehow Njoku is a top 5 dynasty TE and Kittle is nowhere to be found. To me to be a great dynasty player, you have to consider the prior year production. I mean, how is Devante Parker considered the 35th best dynasty prospect when his career AVERAGE is 12 games, 46 catches, 636 yards and 3 TD’s per year! Per game average for his career is 4 catches for 53 yards…. Does he still have upside or potential? YET, Robby Anderson is the 58th dynasty WR with career averages of 15 games, 52 catches, 764 yards and 4.5 TD’s. Very similar career per game averages. And Anderson only has 2 years of experience. Shouldn’t these guys be reversed in the rankings?? To me the ONLY reason Parker is listed ahead of Anderson is where they were selected in the NFL draft. You guys need to take draft pedigree out of your formula and start focusing on actual production. Hey Gaelen, thanks for the comment! First off, I mostly agree with your Anderson and Parker points. I don’t necessarily think they should switch places in the rankings, but as evidenced in my July buys/sells, and in my August buys/sells (coming soon), I think Parker can tend to be overrated, and Anderson, really underrated. About the criteria for these rankings: Believe me when I say this isn’t just subjective speculation. There’s a definite criteria that involved projected years left in the league (age), projected production, and situation. I get why you think Njoku is overrated. But we have to remember, that while he listed as the fifth-best TE in these rankings, the gap between 5-7 was razor thin. The other way as well, there was a major drop off between tiers one and two. I hope this answers your question. Thanks for the comment, Gaelen! I think it is time to revise your top 10 Dynasty TE’s. Your focus on upside/potential vs actual production and your tunnel vision on certain players with their athleticism and draft pedigree have hurt your objectiveness. 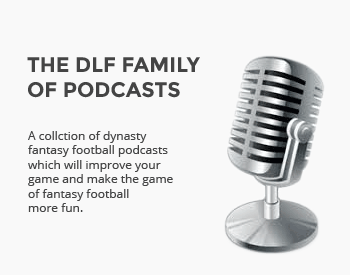 DLF used to be better than this and does have some really deep insight into some articles. Certainly great to be opinionated, but a good writer needs to be able to admit when they are wrong. I can’t necessarily argue with your top 4. But your Tier two is miserable. Njoku, as I said before, is not in the top 10, maybe top 12. Henry is out all year and one of the things that made him a good TE was his speed. It remains to be seen if his speed returns post-injury. Any torn ACL injury to an RB, WR or TE has to drop you down the list no matter what. Howard was doing pretty well before his injury and probably deserves mid-tier and, at the worst, Tier 3 at the 7th or 8th spot. You gave Kittle ZERO love in your article besides the facts. Kittle has elite athleticism (as he is a better athlete than Njoku), he had solid production as a rookie, he has zero competition with other TE’s on his team, he is a starter, he has a solid QB, etc, etc, etc… You even rated Gisecki above Kittle. With all of Giseicki’s elite measurables and being a “matchup nightmare” and not a lot of competition for targets in Miami, then why does he only have 8 catches for 77 yards thru 5 games? You boosted him because of his “draft pedigree”, his measurables and his upside.